Great Value! This Mardi Gras decorating kit includes the following items: 1 pc. 19" Art-Tissue Ball; 4 pcs 25" Art-tissue Fans; 4 pcs. 16" Mardi Gras Cutouts; 4 pcs. 12' Arcade Garlands; 2 pcs. 12" Art-Tissue Balls; 4 pcs. 18" Comedy & Tragedy Faces; 1 pc. 6' Flameproof Mardi Gras Banner. 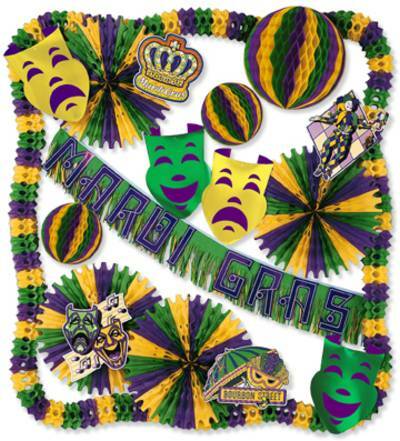 All of these items are in the colors of Mardi Gras: Purple, Green & Gold.